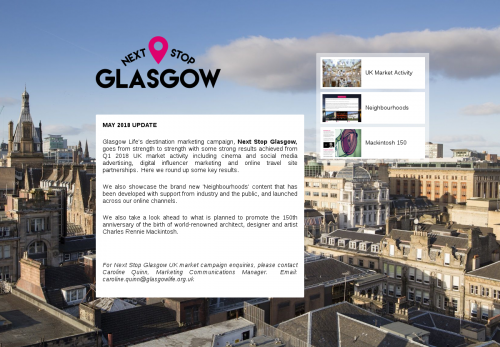 Glasgow Life's destination marketing campaign, Next Stop Glasgow, goes from strength to strength with some strong results achieved from Q1 2018 UK market activity including cinema and social media advertising, digital influencer marketing and online travel site partnerships. Here we round up some key results. We also showcase the brand new 'Neighbourhoods' content that has been developed with support from industry and the public, and launched across our online channels. We also take a look ahead to what is planned to promote the 150th anniversary of the birth of world-renowned architect, designer and artist Charles Rennie Mackintosh.